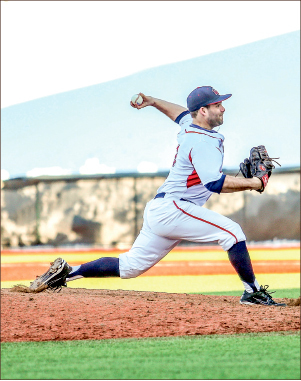 When Liberty baseball’s Shawn Clowers needed a changeup, he found it in the pitch. After two mediocre seasons with the Flames, the left-handed pitcher was left dissatisfied with his performance. As a freshman, his 12 relief appearances amounted to a 2-0 record and 2.63 ERA over 13 2/3 innings. His sophomore year, he made just eight relief appearances for an 0-1 record — his ERA spiking to 10.08 over 10 total innings. Now, flash forward to the start of this season. The senior is coming off a 2014 Gregg Olson “Breakout” Player of the Year semifinalist season. He led the team with 23 appearances on the mound, claiming a 9-0 record — including his first collegiate career win — over 54 1/3 innings and pitching a school single-season record .83 ERA. Opposing hitters were held to a .166 batting average versus Clowers. So what changed? “My changeup got a lot better my junior year,” Clowers said. The changeup looks like a fastball leaving a pitcher’s hand but is slower and dives before reaching the batter. During summer baseball after his sophomore year, as pitchers are apt to do, Clowers was playing with his grips. Fiddling with the way he held the ball and throwing experimental pitches, Clowers hit upon one grip with a lot of movement — something he had struggled to achieve in his changeup in the past. As Clowers rolled with the pitch, so too did opposing batters’ hits — the trajectory of his throw caused right-handed batters in particular to swing on top of the ball and ground out. While the lefty expressed dissatisfaction in the outs he has accumulated on the season so far and a desire to improve his numbers by season’s end, his 2.15 ERA in 10 appearances has contributed to a quiet but strong start for a Flames team primed to make yet another big postseason run. Clowers has played a big part in the success of his team, and he and his fellow Flames are looking to surpass themselves once more. It is safe to say, though, that Clowers may never experience a bigger leap than the one he made from his under- to upper-classman career — all thanks to a changeup in his changeup.